Our new 'stock' cooler for the Techradar test-rig. 'Nuff said. 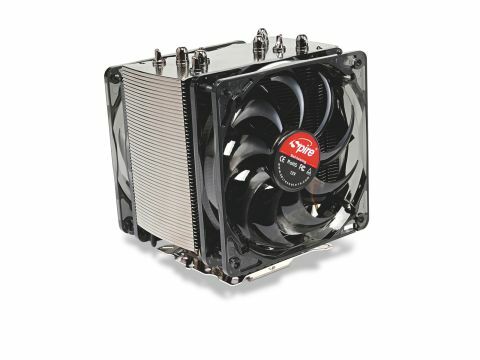 Intriguingly, the first batch of Spire's Thermax Eclipse II CPU cooler hit online retailers in the wrong packaging. We mention this because we received one of these, and were a little confused as to which it was. A squint at Spire's website sets the record straight, since the Eclipse II has black nickel-coated fins, something that immediately separates it from the sea of silver aluminium you're faced with when you browse CPU coolers on any etailer's site, and those looks will definitely appeal to people with a windowed chassis. No less than two 120mm CPU fans adorn this dark colossus, hinting at great cooling performance, and the universal CPU support suggests a lifespan beyond your current system. Will it outperform a stock cooler? And how does it fare against a competitive aftermarket cooler? Let's see.